On the Format tab, the Chart Types group provides buttons for each of the five most commonly-used chart types. These include Bar (default), Pie, Line, Area, and Scatter, as shown in the following image. You also have access to Lightweight Mapping using the Map button. A button labeled Other gives you access to the complete chart library of advanced charts. Note: For more information on how to invoke the version of InfoAssist that you are using, please see Getting Started With InfoAssist. You can run this procedure in Query Design view or Live Preview. On the Format tab, in the Chart Types group, click the button of the chart that you want to create. Bar chart is the default. The chart appears on the canvas. Drag the dimension fields and measure fields onto the chart. Drag the dimension fields and measure fields into the appropriate field containers in the Query pane. On the Format tab, in the Chart Types group, click Other. The Select a chart dialog box opens. The chart types, depicted by icons, display on the left side of the dialog box. To display the name of a chart type, hover over the chart type with the mouse. From top to bottom, the chart type categories are Bar, Line, Area, Pie, XY Plots, 3D, Stock, Special, and HTML5. All supported variations of the chart type appear as thumbnail images in the dialog box. Click an image to display a detailed description of that chart type. If you are not familiar with a chart type, be sure to read the description carefully before finalizing your selection. Some chart types require a certain number of data values, or a certain type of data values. If your data does not satisfy the requirements, the chart will not accurately represent the data. In the following image, the Pie chart type is selected. To the right, the dialog box displays thumbnail images of the chart variations that are supported. Once a selection is made, a description for that chart appears underneath. You can also hover over an image with your mouse to display the chart type name, as shown in the following image. In the Select a chart dialog box, click OK to finalize your selection and close the dialog box. Ribbon: On the Series tab, in the Select group, select the series that you want to display in a different chart type. Then, in the Properties group, from the Type drop-down menu, select the chart type. Right-Click Menu: Right-click the series that you want to display in a different chart type, point to Series Type, and select the chart type. The series appears in the new chart type. When you create a dual-axis chart, you assign one data series to the Y1 axis and another data series to the Y2 axis. The Select a chart dialog box opens. Select a dual-axis chart, such as dual-axis bar, and then click OK. Drag one field onto the Y1 field, and then drag another field onto the Y2 field. When you create a multi-axis chart, you assign one data series to the Y1 axis and another data series to the Y2, Y3, Y4, and Y5 axes (as needed). Select a multi-axis chart, and then click OK. Drag fields onto the Y1, Y2, Y3, Y4, and Y5 fields, as needed. You use the Lightweight Mapping functionality to create a map in InfoAssist. Note: You must use the HTML5 output format to access this functionality. Launch InfoAssist in Chart mode. On the Format tab, in the Chart Types group, click Map. 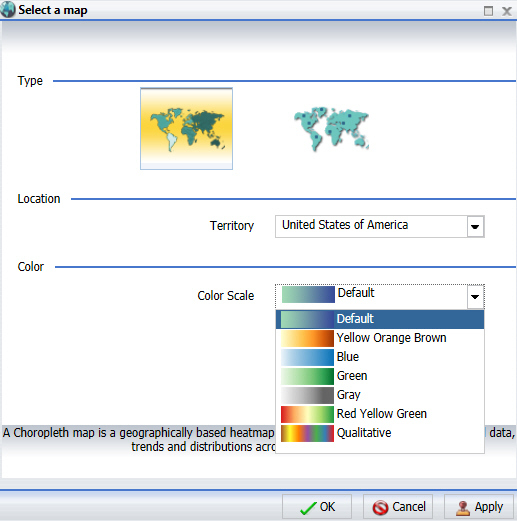 The Select a map dialog box opens, as shown in the following image. From the Type group, select Choropleth map or Proportional Symbol map. 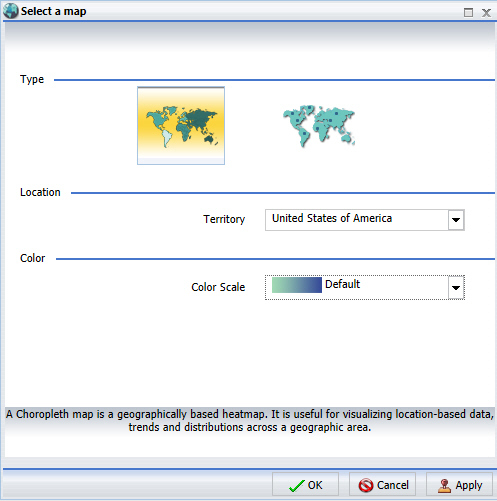 Choropleth map is selected by default. From the Location group, using the Territory drop-down list, select a territory (for example, United States of America). Note: This section allows you to pick geographic locations for which maps are available. You can select a territory option from the drop-down list. For example, some of the available territories include World, Europe, or United States of America. From the Color group, using the color scale drop-down list, select a color scale. For example, Qualitative. Note: This section allows you to pick a color scale for a choropleth map, as shown in the following image. For a proportional symbol (bubble) map, the color selection option is disabled. A Measure field. For example, Discount. A Location field. For example, State. Note: Latitude and Longitude field containers are available for proportional symbol (bubble) maps. You can specify latitudinal or longitudinal data using these fields. When the location field is specified, the Location Type dialog box displays, as shown in the following image. The Location Type is needed for geocoding, which is a process through which fields are assigned to a specific geographic dimension (for example, ZIP Code, State, or Country) so that it can be matched correctly to the geographic coordinates. The geocoding process will occur once you add a geographic field to the Location data container. You can also access the Location Type dialog box by right-clicking on the Location dimension in the Query Design pane. From the menu, select Geographic Role. The Location Type dialog box opens, from which you can make a selection. From the Geographic Role drop-down list, select State name. 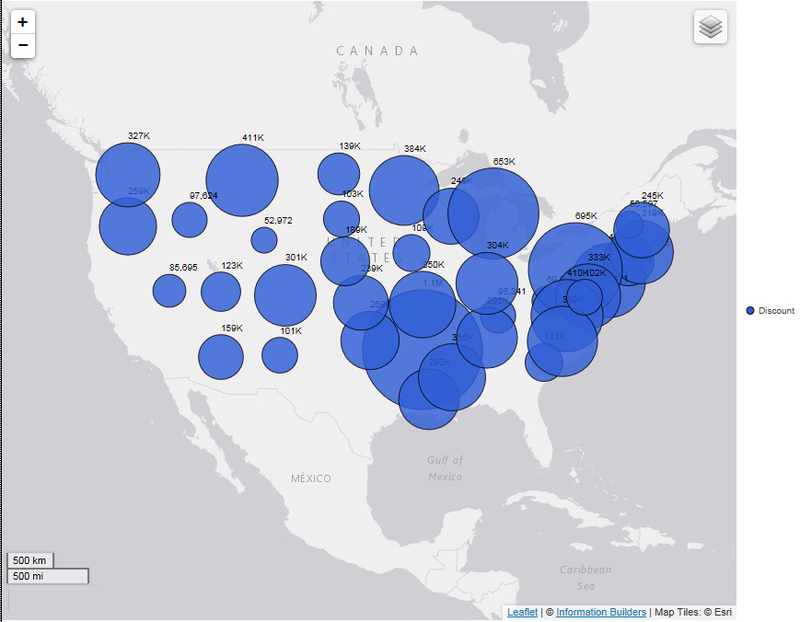 The map displays based on your data and selections for Type, Location, and Color. For example, the following map shows the geographic location, using a proportional symbol map, of Discount data by State in the United States. Note: Not every chart type can be output in every format listed here. To make sure that the chart that you are creating can be output in the format that you want, please see the topic for that particular chart type.